This list is designed as a handy jumping-off place to start doing your search engine registrations and getting listed in the directories. It is also a very long list, originally written by me, Jere Matlock, the owner of Words in a Row. I started this list for myself some years ago, to keep track of where to submit my client sites when registering them with the search engines. When word of the list got out, I received many requests to open it up to the public. Since it was posted for public use, the Words in a Row team has worked to keep it up to date. Now there are people who swear they will come gunning for us if we ever take this information down or charge for it! We no longer maintain the short version of the list -- it was too much work. (It's hard enough to keep this page current.) Instead, this page has been shortened considerably and broken down into separate lists for Directories, B2B Resources, Search Engines, Pay-per-Clickthroughs, and many sub-pages with other helpful information. If you have information about one of the search engines or directories that you think belongs here let us know and we'll most likely post it and credit your contribution. It would help other people to get registered more quickly or more easily. You can send me an email with your comments, feedback and any corrections or additions you think should be made. If you want our chatter about these search engines, background info and more advice, click on the "MORE ADVICE" links down the page. MORE ADVICE: How to use this page. MORE ADVICE: Should you optimize your website before submitting it? By now you may be thinking that registering your website with the search engines by hand is going to be a lot of work. It is. If you're interested in hiring us to do it for you, here is a shameless plug for our services. We have sorted this list of directories by likelihood that real traffic will come to your website from it, in terms of human popularity. As you go farther down this list, you have less of a chance that the listing will actually be a direct source of traffic for you. However, that does not necessarily mean it won't help your search engine rank. We don't include directories on this list without a reason -- there are literally thousands of them out there. We try to keep the list to just the SPAM-less, trustworthy and human-reviewed directories. MORE ADVICE: How to get into Yahoo! Procedure: First make sure your site is fully functional, with no "under construction" pages. Then at Yahoo! select the exact category of their directory in which you want your site to be listed. Keep digging into their directory structure until you're absolutely sure you have the exact right category for your site, then click on the "Suggest a Site" button on that page so you can submit your site from within that category. If you have a business website, you MUST pay $299 (see Hard Costs) and use the Yahoo! Express submission service to register your site. To make a change to a listing you already have at Yahoo!, use this Yahoo! Directory changes form. The above charge gets you listed in Yahoo! 's directory only. See also the Yahoo! Search Engine and Yahoo Search Marketing (pay-per-click). If you click to the "Directory" tab at Alexa, you are actually looking at ODP, so submission there gets your into the Alexa official directory. But what we mean is getting yourself into Alexa's actually website listings, which is a sort of mix of directory (in that you can edit your listing) and search engine (in that it probably already has your site in it if anyone out there has visited it with an Alexa toolbar installed). Despite that the ODP/Alexa thing is a bit confusing, there are ways to make sure your Alexa listing (not the ODP one, but the Alexa one) is accurate and informative. Read on. First, check if your site is in Alexa already. With the Alexa Toolbar active, navigate to your site in the browser, and then use the Alexa toolbar to access Alexa's information about your site. If you are not listed, you can enter your site into it. Try to provide an accurate, keyword-using description of your site, as Alexa directory listing information is widely used. If you are already listed in Alexa, but there is an error in the listing, there is something you can do about it. Go to Alexa, search for your listing, click on it, and you will be on a page full of details about your site as collected by Alexa and reviewed at Amazon. You cannot make changes to the reviews or to the statistical data that Alexa has gathered. But, you can make corrections to Alexa's data about your site or your contact information. At the bottom of the page you will see a link that reads something like "edit site info" or "edit contact information". Click on that to get started. Creating or editing your listing at Alexa is free. We highly recommend that you at least make sure that your Alexa listing has accurate information. Dig into the categories at About.com. Find the exact category in which you want to be listed. Find the bio page about the guide for that category. Then find the link to send an email that guide. Send the guide a short, polite email with details about the site you want in About.com. It's free. If you don't succeed at that, the other option is to advertise with About.com instead. You have to pick (go into) one of their categories first, then click "suggest URL" from that page. If there is no "suggest URL" button on that page, you need to keep digging into sub-categories. Enter only your main page, "http://www.yourcompany.com". It takes as long as it takes for one of their editors to visit your site and agree with your category choice--typically less than a month. It's free. Lately it has been getting harder to get into ODP. Here is some good advice from someone I respect: Jill Whalen of Search Engine Guide. She tells you how to better your chances of getting into ODP, especially if you've already submitted your site a couple of times and haven't been picked up. According to the ODP rules, you are advised to submit ONCE - if you're not picked up in a month, contact the category editor. Re-submitting will not gain you any friends AT ODP - it just adds to their editorial backlog. If your site isn't picked up within a month, send an email to the category editor. If there IS no category editor, go up the categories tree until you find one. Then contact that editor. Note - all these ODP editors are volunteers. Consider joining them and becoming an ODP editor yourself. Here's a link to the ODP forum, where you can get questions about the Open Directory Project answered by actual ODP editors. After you submit your site to ODP, you can use this free service ( seotie.com ) to monitor whether or not the site you submitted has made it into the Open Directory. While soetie requires setting up a free account, it can be worth the time it takes to do so, to confirm that your site made it in. Otherwise, you won't find out unless you go check, yourself. AOL uses Google, which uses DMOZ.org (also known as ODP / Open Directory Project) to provide their directory. Just submit to ODP and you are covered at AOL Search's Web Directory. The AboutUs wiki is a user-editable site about every website in the world. Once you search for your website, you will be looking at your website's info from the AboutUs wiki. If someone else hasn't already added your information to the wiki then new info will be automatically generated. Look over your page. If it is incomplete or needs correction, then create a valid username, verify your email address and log in at AboutUs. You can then freely edit the information about your site. We recommend you take care to add only accurate information to the wiki. You can also edit any other website page there, but your IP will get banned if you abuse the privilege of being able to edit the wiki. A small human-reviewed directory started by guides from the Go Directory. It is worth taking the time to dig through their categories and register here. It was free until March 2003, now it costs $39.99 to suggest your site (non-refundable, one-time fee). Up to you whether it is worth it for you. We suggest looking in your category and seeing if your main competition is registered here. If so, you should probably register here as well. Also, registering here should help your Google Page Rank. Drill down, choose a category and submit from there if your primary competition is listed. Submission and review costs between $59-$159. Editors may choose a new category/title/description for you (which you might not like so much) if you don't choose wisely, so be accurate and informative in your site submission. If you are not accepted, the money if refunded. All categories are listed here. We only recommend this one if lots of your competition is also located here. Ezilon costs $69.00 as a one time fee. Drill down in the categories until you find the category that you belong in. Then click in the top right corner on the "Submit a Site" button to be considered. If a lot of your competition is listed here, it may be worth it to you to also submit. Drill down, choose a category, and then press the "Submit a Site" link on the right menu. If the category is open, you'll reach the submit form. It costs $50.00 as a one time fee to be considered here. It is up to you if it is worth it - which it might be if your primary competition is listed. BOTW is human-reviewed. You can pay $79.95 a year or $239.95 as a one-time fee to be reviewed for inclusion at BOTW (see Hard Costs). They have been an active directory since 1994, making them one of the oldest directories on the web. We've recommended BOTW and provided the above link for ten years. In 2007, we signed up as a reseller. We may get a commission if you use our link to BOTW to sign up. The WhatUSeek Collection is a human-reviewed directory. They display their own "WhatUSeek Collection" directory listings above supplemental ODP results, which are called the "WhatUSeek Directory" but is solely ODP. You can pay for "Velocity Submit" -- $49.99 -- to get listed within two days, or pay for "Standard Submit" -- $29.99 -- to get listed within eight weeks. It usually takes less time than promised to get listed here. There is also a continuing annual subscription charge of $16.99. The LII, the librarian's Internet Index, is not easy to get into, and is not worth trying if you're overtly commercial (if you straight-out sell something). If you have an information-rich site or page, you should submit here. Again, it is not for commerce driven sites, or those with content easily found elsewhere. Links from this directory are heavily weighted, because it is librarian reviewed. There is no need to drill down to select a category - the Librarians will choose one for you. Submit an accurate description that contains as little marketing hype as possible and, if possible, highlights unique informative content your site or page can offer visitors. It is free. After you submit, there are more steps to ensure you're not spam and not commercial. You will receive instructions by email. If the librarians decide that your site qualifies for their directory, you will be asked to continue with further steps. Because of the difficulty of getting in, links from the LII are considered very reputable. This sleek and modern directory is relatively new. It costs $35-$75 to submit your site here for human review. We recommend the $35.00 option - but not if you aren't willing to place a reciprocal link on your site. If you're not approved, they may refund your payment - excepting a few special circumstances such as not having been qualified per their terms. Read them well. At the Starting Point directory (around since 1995), you need to drill down into the directory until you find your competition, then find the "submit site" link (top right). You will be asked to check if the category is correct, and then to provide site details. (Note: When submitting your site, don't put anything in the "suggest category" box unless you didn't find a suitable category already.) Every time you fill out a text box on the submit screen, you will need to pause to let the page reload. Don't rush it. Cost here is $99.00 a year to submit, which is not returned to you if you are disapproved. Make sure that you use a truthful and accurate site decription. Directory links here are heavily weighted. It is human reviewed and they don't accept everyone. It is up to you if the cost is worth it. It costs $20 to list 5 URLs here (if you use their intro special) for an annual listing. It is up to you if it is worth it. We recommend it if your competition is also listed here. Go Guides is a small directory, the editors of which were originally some of the guides who formerly worked with the Go.com directory, which Disney bought and closed down. GoGuides is picky about who gets in. GoGuides asks a one-time fee of $69.95 to review and list your site using their "Easy Submit" process, or $39.99 to "Express submit" - choose your own category and description, etc. In 2004, GoGuides had a method to submit for free. But as of 2005 all public submissions now require a one time review fee to be processed. This policy is said to help keep their directory clean. They also started an affiliation at that time with www.links2go.com, offering a deal with directory submission at GoGuides and double your money in credit on an account with links2go. If you are looking for a linking program, you may want to take advantage of it during sign-up. A smallish international directory owned by the same people who own the Sporge directory. It is worth taking the time to dig through the categories and register here. Doing so should help your Google Page Rank - Google uses directory listings like these as one indicator of the importance of your site. Cost here is $44.99 by PayPal, or you can sign up to be the editor of a category and submit your site for free. Qango is fairly small, but well organized. We used to recommend their free option, but they appear to have stopped offering it. You'll need to pick a category and subcategory until you find the right place for your site, then click on the "suggest a site" button on that page. You can pay them $50.00 to get in within a few days but the expense seems to be high for what you're getting. It's up to you if you think the cost is worth it. Site Sift is relatively new and has three submission options between $29.95 and $99.95. The $49.95 option does not require yearly renewal. If you intend to keep your listing for more than a year, use the $49.95 option here. Drill down, choose your category and submit from there. You can see all the categories from the sitemap. It is up to you whether the cost is worth it here. We recommend it only if your competition is here and you've got the money to spend on directory listings. Pay anywhere from $24.99 to $79.99 a year to be reviewed for placement here. We recommend the cheaper submission options here, and only paying more if there is lots of competition in your category. Drill Down into the directory to find the right category and click the "add website" button. Cost is $40.00-$99.95 here. We recommend only the cheapest option. Drill down into the directory until you find your competitors, and click on the "Add URL" link. It will cost you $39.95 via PayPal to submit here. This human-reviewed directory is free only if you place a link to them on your site as specified. Or you can pay $39.95 for a listing if you want. We don't recommend the reciprocal link set-up, just paying. You'll want to register in option #2, which is their directory. Option #1 is for a sponsored listing, not a directory listing. The price ranges from $20.00 to $40.00, depending on which listing type you choose. Payments are made through PayPal only. They also offer a free classified section. This directory appears to be down as of August 2009. Another paid directory. They promise guaranteed instant placement, amongst other things. It costs $69.95 to submit here. Another small directory. Dig into categories, submit your site from within the relevant category. Used to be free - as of June 2004 they are charging $20 for a commercial website ($40 for top placement). In July 2004 they have split off a UK version. Another new, smaller directory. Can't hurt to register here and sign up is simple and takes about two minutes. Up until November of 2005, they were free. Cost now is $11.00 per year. Find the right category for your site, then click the "submit your site" link. Yet another popular way to search the web. It is constantly looking on the web itself for new websites, but it does not accept requests to index individual pages. There's no way to add your URL to their site, but if your site is already in, you CAN edit your listing in their directory, if you need to. (Thunderstone uses an algorithm to categorize your site and it often gets it wrong.) They've set it up so you can change categories if you think you are in the wrong one. It's a novel way to do it -- their blurb says it would take about 80 humans to do what Thunderstone does to categorize all the sites it finds. Note well--it is not possible to ADD to Thunderstone, only to edit your listing, here. It's free. Around for ages, the Information Outpost directory is human-reviewed and costs only $5. It is considered a reputable link as directories goes, but the interface is a bit chaotic. If your competition is listed here, it is worth the money for you to list here. Drill down to see, then submit if you feel you should be listed beside the others within your category. There are TWO category lists here, so scroll down to view all while drilling down to find your correct category. Then click on "submit a site" from within the correct category. Submission here is free if you set up a reciprocal link, otherwise it costs $24.95 via PayPal to get listed here. This is a small directory that re-opened under new management (Skaffe) in August 2005 with lower submission prices. Cost to submit here is $10.00 - $15.00, by PayPal only. It can't hurt to dig down into their directory and submit your URL from within the correct category. Another small human-edited directory. It is worth taking the time to dig through their categories and register here. It costs $39.99 for Express Review within two days - you can pay by PayPal or by credit card. Aside from usefulness as a Directory listing, being accepted here means that you'll be included in their XML sitemap, which Google checks regularly. This may or may not be useful to you, depending on your status at Google. Where2Go is a directory of businesses only. You'll not only need to pick a "Yellow Pages" category, this site asks for considerably more information when you register there. Be prepared to spend ten minutes or more at this site just going through their registration process. The good news is it's free. For those of you who run B2B websites, here is our list of B2B directories to register with. We've moved it off this page because it grew. There are a lot of directories on the web. Most are totally useless to you, and many are even a new form of directory scam. If you're not sure about a directory, don't pay to be in it. The above are our hand-chosen list of directories. Strongest Links has a good list of directories here if you're not feeling like you've submitted to enough directories yet. We maintain a list of other directory submission tools on our tools page. MORE ADVICE: We really don't recommend a reciprocal link directory submit option when there is one unless you're in a bind -- these mean that you get in for free, in exchange for a link from your website to theirs. For one thing, they really can stack up and water down your website's message. Congratulations -- you've made it through the main directories on the web! 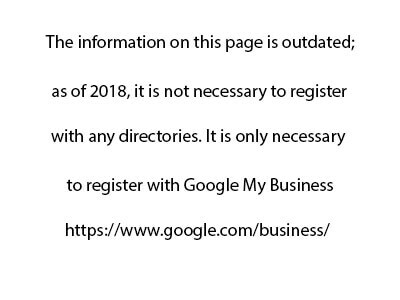 This page tells you exactly how to do directory registrations and search engine registrations by hand, yourself, one search engine and directory at a time. This page contains links to the specific pages where you can register your website by hand with all the major search engines and directories. Lots of advice on what to do (and not do) when registering your website with the search engines and directories. Visit Heifer.org and give someone who desperately needs it an animal. This site is doing something uniquely effective about world hunger and poverty. This one actually works because it teaches people self-sufficiency and gives them the tools to succeed at it. Heifer International has placed millions of livestock animals with needy people around the world.